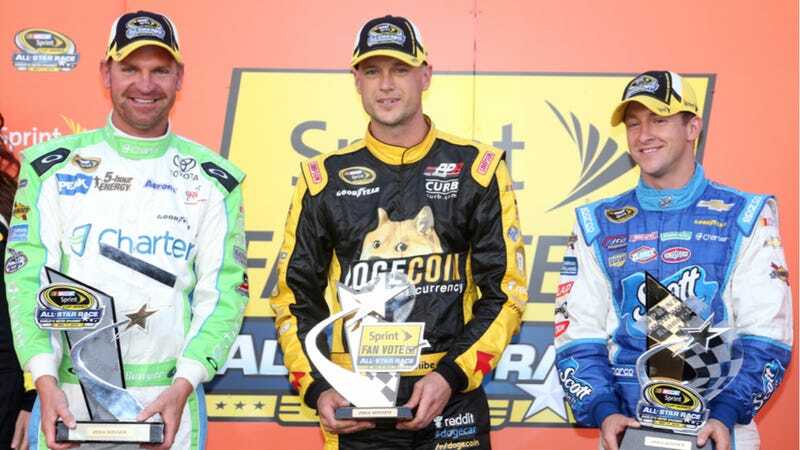 Dogecar driver Josh Wise won the fan vote to make it into the NASCAR Sprint All-Star race tonight, edging out such luminaries as Danica Patrick. Patrick, for her part, blamed shadowy "outside sources that are in control" for the loss. The race tonight should be fun. It's been a bit of a wild ride for Wise, starting almost as a joke by the DogeCoin cryptocurrency community back in March, and then becoming very very real when more than $50,000 was raised to slap a Shibe on his car. The Dogecar made its debut at Talladega on May 4th, 2014, and that was supposed to be that. The sponsorship was strictly a one-shot deal. It paid dividends for both Wise and Doge, however, including much publicity for the currency, despite NASCAR announcers needing the Google Machine to understand it. But Wise said he would keep the livery for the All-Star race if he won the fan vote, and Doge fans turned out in droves. Either that, or the Illuminati, depending on which Danica Patrick you ask, I guess. So tonight, as an encore presentation, you get just a little more Doge.